Family tribute to Reeva Steenkamp Jump to media player The family of Reeva Steenkamp have given brief statements following a private memorial and cremation service in her hometown of Port Elizabeth. Funeral service for Steenkamp Jump to media player A private memorial and cremation service for Reeva Steenkamp has been held in Port Elizabeth, the model's hometown, following her death last Thursday. Reeva Steenkamp memorial to be held Jump to media player A private memorial service will be held on Tuesday for Reeva Steenkamp, who was shot dead last week at the South Africa home of the athlete Oscar Pistorius, who denies a charge of pre-meditated murder. 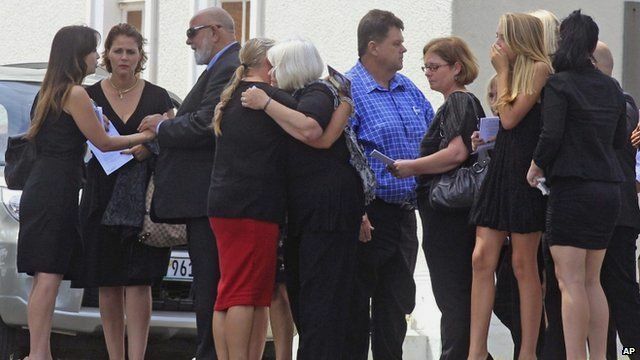 The family of Reeva Steenkamp have given brief statements following a private memorial and cremation service in her hometown of Port Elizabeth. Miss Steenkamp's uncle Mike spoke about how her positive outlook had helped other people. Her brother Adam said there was "a space missing inside all the people... she knew."